Three of the four brothers are accused of participating in the disappearance of 43 normalistas of Ayotzinapa; this past week Federal Forces detained one of them with arms and drugs. 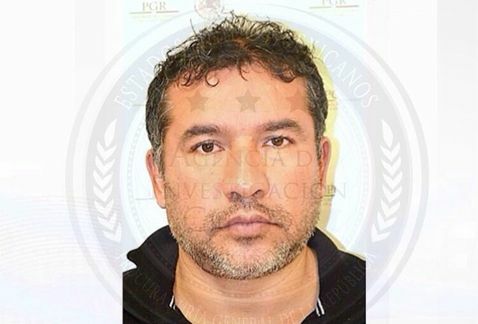 Sidronio is now implicating Carlos Ahumada of links with him, La Familia and selling uranium to China, and of helping escape in his helicopter, a leader of a criminal group in Tierra Caliente, Johnny Hurtado, "El Pescado", alleged leader of La Familia Michoacana. 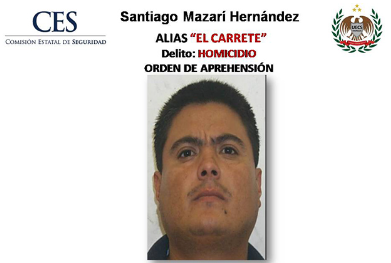 Mexico City, The Casarrubias Salgado brothers, forged their leadership of the criminal group Guerrors Unidos, which operates in Guerrero, Morelos and Mexico State, and among other activities transported heroin to Chicago, United States. Three of the four brothers are accused of participating in the disappearance of the 43 normalistas of Ayotzinapa in the Iguala municipality, where the ex municipal president, Jose Luis Abarca, and his wife, Maria de los Angeles Pineda, were working with the criminal group according to the PGR. Mario and Sidronio are detained, Jose Angel is sought by the authorities who have offered a 1.5 million pesos reward for information leading to his capture. Adan was detained last week with guns and drugs. He was leader of Guerreros Unidos until Federal Forces detained him in Toluca on 29th of April last year. The criminal group operate in Guerrero, Morelos and Mexico State, informed the National Commissioner for Security, Monte Alejandro Rubido one day after his detention. "El Sapo Guapo" is accused by the PGR of being the principal trafficker of drugs to Chicago, United States, hidden in trailers of fruit and passenger coaches, crimes against health, being a member of a criminal organization, possession of fire arms, murder, kidnapping and extortion. 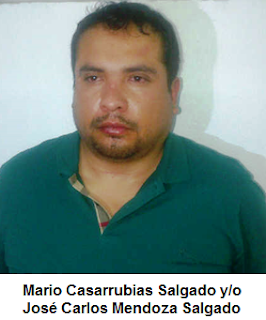 Before being part of Guerreros Unidos, "El Sapo Guapo worked as a security element of the Beltran Leyva Organization, Mario Casarrubias founded his own criminal group with ex members of various groups in Michoacan and Guerrero. Inherited the leadership of Guerreros Unidos after his brother Mario was captured and continued the strategy of violence to control his drug routes. The then prosecutor Jesus Murillo Karam said on the 17th of October that Sidronio is linked with the disappearance of the 43 normalistas of Ayotzinapa. "He said no, that he was informed, that he didn't order it, and that he opposed it, he remembers in his testimony, he said that he didn't order it and that it was a situation unforeseen", said Murillo Karam. Sidronio was imprisoned in the maximum security Cefereso no.1 "Altiplano", in State of Mexico, and a Federal Judge initiated a penal process against him for the crimes of being a member of a criminal organization and possession of fire arms for exclusive use of the armed forces. The authorities had designated him as possible successor to his brother Sidronio. On the 29th of October, military and federal police detained him in Cuernavaca, Morelos, with the municipal president of Cocula, Guerrero, Eric Ulises Ramirez Crespo. Federal functionaries commented to Milenio that day that at the moment of his capture "El Tomate" was in possession of fire arms and a package of drugs. The PGR consigned "El Tomate" to Cefereso no.11 in Hermosillo, Sonora while waiting for a Judge to resolve his jurisdictional situation. The PGR are offering a reward of 1.5 million pesos for information leading to his capture, and is allegedly one of those responsible for the disappearance of the 43 normalistas. Sidronio, also known as "El Chino", didn't only confess to the PGR that Maria de los Angeles Pineda Villa is whom "was really in charge in Iguala", but also about the alleged links that Mayors had with his and other criminal organizations, and businesses with empresarios like Carlos Ahumada Kurtz. Persons who had access to the initial investigations and testified in the Iguala case permitted Milenio to know the details of his declaration of made on 18th of October of 2014 before agents of the Federal Public Ministry, where he affirmed that Ahumada is an acquaintance of Johnny Hurtado Olascoaga, "El Pescado", leader of "La Familia Michoacana". In all, functionaries of the Federal Government revealed that the PGR investigated Ahumada for his probable links to criminal organizations in Guerrero. An investigator, signalled that SEIDO started the investigation based in part, on the declarations given by Jose Maria Chavez Magana, "El Pony", alleged boss of "La Familia", and Sidronio Casarrubias Salgado. El Chino affirmed that Ahumada is an acquaintance of El Pescado, leader of La Familia Michoacana in Tierra Caliente, with whom he traffics uranium. 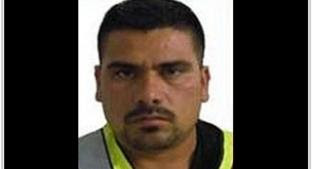 According to information given by consultants both State and Federal, "El Pescado" or "El Pez" assumed the leadership of this criminal group after the detention of "El Pony" in July of 2014 in Guanajuato. "El Pony" operated in the Mexican Municipalities of Tejupilco, Luvianos, Tlatlaya, Otzolotepec, Amatepec, Zacualpa and Zacazonapan, localities that adjoin Guerrero. In the investigation opened for the disappearance of the 43 normalistas of Ayotzinapa, that he was not questioned, and that Sidronio declared that Carlos Ahumada is the owner of two mines in Guerrero, where they are digging uranium. "One of the mines is in Campo Morado, Tierra Caliente, Guerrero. The cargo was transported by boat, but Ahumada hid the uranium ore among other combined ores, and transported them to Lazaro Cardenas, but the majority of the cargo went to Port of Colima, where it was loaded directly onto Chinese ships with which they dealt. This mine is also exploited by a Canadian business", said the Federal Public Ministry agent. Sidronio mentioned that when "El Pescado" was in danger of being arrested and detained, Ahumada facilitated on several occasions an aircraft to use in escaping Federal agents. "I add that when "El Pescado" was in danger of being detained by any Governmental authority, Carlos Ahumada helped him with a helicopter that he owned, it was also used to help "El Fresa", who is the cousin of Jose Alfredo Hurtado, who in reality is the brother of Johnny Hurtado". "In the same way "El Pescado" is an aficionado of Soccer, and utilised the helicopter to access part of Mexico City or Toluca. Ahumada when digging uranium has to pay 20 thousand pesos per boat to "El Pescado", who is the top leader of "La Familia", said the Boss of Guerreros Unidos. 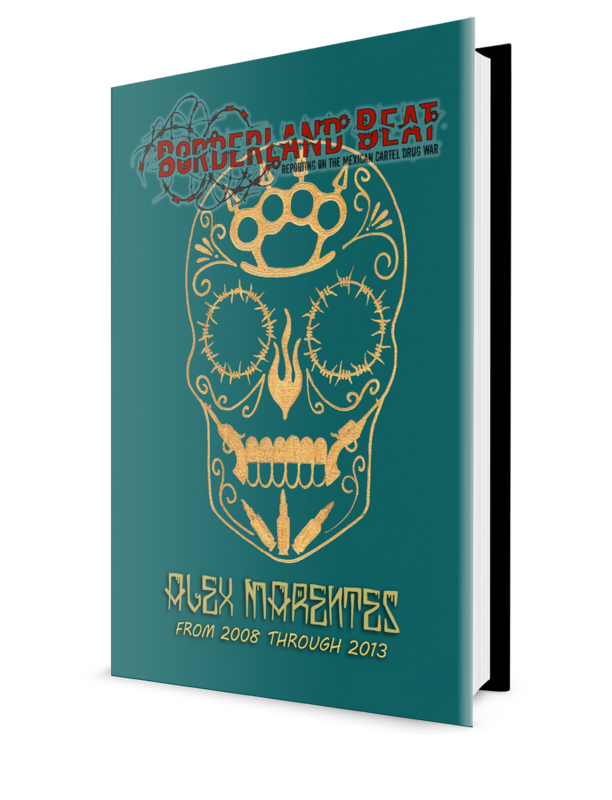 Guerreros Unidos, referred Sidronio, was founded by Cleotilde Toribio Renteria, "El Tilde", who was detained in the Santa Fe zone in Mexico City, on the 9th of July 2012. "El Tilde", added Sidronio, is the brother of Sostenes, Federico and Serefino; and points out that this family evades capture particularly the brothers Federico and Moises. Sidronio and his brother Mario Casarrubias, "El Sapo Guapo", took administrative control of Guerreros Unidos at the start of 2014; however, Mario was captured in Toluca, State of Mexico, during April of this year in an Army operation. El Chino also detailed the conflicts that there are between the criminal organizations which operate in Guerrero. "... there exists a war between the different Cartels, they are Los Rojos, led by Omar Cuenca Marino and Santiago Mazario Hernandez, "El Carrete", also a member of La Familia Michoacana, led by Johnny Hurtado and Alfredo Hurtado, "La Fresa". "The simple kinship with Mario was the objective of these groups, during which they only tried to move in municipalities that had a presence of Guerreros Unidos; among them I could mention Iguala, Taxco, Cocula, Buenavista de Cuellar, Tepecua, where there exist arrangements with the Municipal Presidents, and principally with the Directors of Public Security, arrangements that had already been made between them and Gil (Gildardo Lopez Astudillo)". In Iguala there were arrangements directly with Jose Luis Abarca Velazquez and his cousin Felipe Flores Velazquez, ex Secretary of Security for this locality, who is sought for the disappearance of the 43 normalistas. "The arrangements were held with Senora Maria de los Angeles Pineda Villa, sister of Borrado ( Alberto) and "El MP" (Mario) who were close collaborators of Arturo Beltran Leyva and that they were assassinated on orders of the capo, this woman Maria de los Angeles is who sent all the money to El MP, and is who is really in charge in Iguala, and the money collected from the municipal presidency pays for the protection of the narcos", he said. Guerrero Unidos received the money from Iguala and took it to Raul Salgado Hernandez, "La Camperra", and "El Gil", who were in charge of distributing it to their members located in other municipal presidencies. In the municipality of Huitzuco, they had "El Gualter", but he betrayed and went to the side of "El Carrete", leader of Los Rojos. "on the part of Teloloapan was "El May", who is also chief of sicarios in Iguala, in State of Mexico, Ixtapan de la Sal; there didn't exist a Captain, as we called plaza jefes, but we appointed the Police Director, who was known as "El Chaparrito", real name of Efrain Pedroza". "On the side of the state of Morelos is El Carrete, who I already referred to as being against Guerreros Unidos". "In the town of Acapetlahuaya ( Guerrero ), we have against us already the Municipal President Eleuterio Aranda Salgado known as "El Solitario del sur", he represents the armed wing of Johnny Hurtado; including Eleuterio the can search the Internet and leave singing narco corridos of La Familia Michoacana; in this zone has the presence of a subject nicknamed "El Chainis", whose name is Jose Mendez Lopez, and he controls Palmar Chico and Palmar Grande, Guerrero this group includes those persons who carried out the kidnappings in 2014 in Valle de Bravo, State of Mexico. "He also gives support to the people of Amatepec, Edomex, and Ixcapuzalco, Guerrero, and who is equal to Rogaciano Mecino, President of Cuetzala, above all they give social support to the sicarios of the organization. Additionally they have that take care of poppy planting in a place they call "Rio Chiquito", he added. In the town of Arcelia, Guerrero, added Sidronio, they hide "El Pescado", who is the owner of a gas station in this location. Otis-B,thanks again man,interesting post on the competing groups of Michoacan and its environs.CJNG must be seeing chances to move on in,seeing as many are Michoacanos themselves like Mencho Oseguera Cervantes who is allied with Mendez Vargas,Viagras,H3 ? Such detailed intel--names by the kilo, revisionist history piled high by the pound--leaves out what's at issue: the plain truth. Rummor has it the cartel was using those buses to more heroin hidden on them to the US. Seems a few weeks before the kids stole a bus with a few million dollars worth on it. When they came back for second bus they were hit hard. That's what I'm hearing. The military and the government were in on the moving of the heroin that's why they helped out ridding the problem (the kids). As I said just the rumor I heard. But it makes the most sense of everything I've heard. That's what folks are saying. That the kids took a bus, loaded with cartel dope.It's about the only logical explanation. Not that it's any excuse, or a reason, but it explains a lot. It's no big secret, that dope is moved on those buses everyday. As far as the govt being involved...we are talking about the Mexican govt. They are criminally organized, with all the cartels. But, I also think, it's a lot more 'involvement', than we are aware of. The govt could easily have taken their bodies and cremated them somewhere. Most likely it's a lot less people who know what happened to their remains, than those who were involved in the initial attack. Those sent to 'clean up the mess', were most likely, all govt folks....military. You don't send your punk gangsta boys, to do something on this scale.At the end, it was dealt with, by very few. Those who were assigned, to that 'job', are most likely dead themselves now. We might not never know the full story on this. I hope so, for their families...and the victims also. But I will never, ever believe, those bodies were burnt in that trash dump. I think, by that time, it was out of the hands, of anyone outside of military. Only the military, could have pulled off something this size, without bodies being found. Guy in mugshot reminds me of Z40 some. maybe, they got the same poppy. They are indeed doing that, if you keep an eye on my flywheels weekly drug bust roundup, there is quite a bit of narcotics hidden on buses, and this week they searched an air medical ambulance flying through mexico , and found 36 key's of cocaine on it. The Mexican Government, it's Military & the US Government all know about the drugs. Too much money is involved. 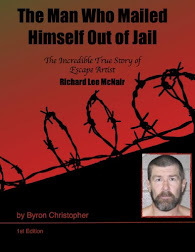 Even in the US with private prisons, lawyers, police equipment & training, rehab centers, ect. Too much money to be made to turn off the supply of drugs. --monitoring them on C4 all over ayotzinapa, cocula, Chilapa iguala a d el DF, with police military and Guerreros Unidos in the effort. --federal government making excuses for not allowing investigators other than their mombo mombo pseudo scientists and "investigators"
--SEE, it is not us or the students or the foreigners involved, but the federal government trying to repress the October 2 2014 marches conmemorating the HALCONAZO OF LUIS ECHEVERRIA ALVAREZ in OCTOBER 2 1972 against students in el DF that unleashed a revenge against the ayotzinapos and to teach them a lesson they would never forget, because emilio chuayffet chemor was sick and tired of them and their smart mouths, as was angel aguirre rivero, former governor Ruben Figueroa Alcocer, ernesto zedillo, and peña nieto, among others, they delivered their lesson, and want no more complaints from anybody or they will kill again...#ya chole con tus quejas vs #ya chole con tus pendejadas peña nieto! Just want to say that the kids commandeered a bus to take them to an organized protest, they weren't out stealing buses for kicks and giggles. They picked the wrong bus. The last days and moments of their lives are impossible to imagine, but rip your heart into pieces nonetheless. Their deaths cannot be in vain. The townspeople know what went down and who is responsible. It's the government that's playing dumb, sputtering on out of both sides of its mouth about investigating to the fullest, while they're trying to cover everything up at the same time. My prediction is that these michoacanos and guerrerenses are making millions so the goverment wants a peace of it. Michoacanos and Guerrerenses are making alot of money of meth and heroin. Most meth and heroin comes from those states because of the fertile land. Thats why so moch soldiers are over populating there. What happened to the Zona Norte Tijuana Post? with J's approval I took it down. The story was overlooked and all the comments coming in were pathetic immature garbage or worse. it was not worth my time. I thought It was a good article very informative.